Perfectly Pink is the theme that Cindy of Cottage Remnant set for this week's Inspiration Avenue Challenge. I hope that I have enough pink in my composition for it to qualify for the theme, but even if I do not, it was seeing the challenge that provided me with the prompt to experiment with the stencil (Dreamweaver) I recently purchased after Glenda featured it in the weekly Chocolate Baroque email & on her blog. I used Faber-Castell Polychromos pencils for outlining & colouring the various sections & then blended using paper stumps with Sansodor. I actually allowed the page to dry/settle over a couple of days as I wasn't sure how the Pigma Micron pen would react to the moisture of Sansodor & then outlined & tangled the various patterns. I'm rather pleased that it's in my little Rhodia Notebook since it is the first time I have attempted anything like this. I'm rather enjoying the freedom of not matting or making the inside of a card. This is lovely Paula the colour really enhances the patterns. As soon as I saw your piece it occurred to me that zentangle pieces always seems to be black and white or at least predominantly that colour. So it's really interesting to see you experimenting into colour with great affect. Love the colour that you have added and using tangles to complete the stencil is a great idea, nice border pattern as well. I have also bought a book with the dots (not the moleskin - perhaps next time) and find it very useful to try ideas out its much easier to get the grid patterns evenly spaced. Wow Paula, this is pink enough for me, love how you have zen tangled the stencil, I must give that a go one day! You did an excellent job on your tangled flower, Paula. It looks like it is an appliqué. Blessings! Just the right amount of pink Paula!! I love how you combined your love of Zentangle with your coloring. The design just comes to life with your creative details. Look!!!! I've braved it but I am not letting myself become obsessive!!! It is beautiful, your design (if you know what I mean) is perfect and wonderfully balance, stunning!!! Hi Paula, I did the same flower, but in B&W. 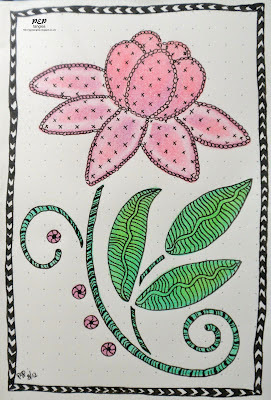 It's posted on zentangle fb page. Yours is so pretty with the colors which is something that scares me to do. Love your other tangles too.